This year's dismal UK summer could be part of a run of poor summers caused by a major warming of the North Atlantic Ocean that occurred back in the 1990s. 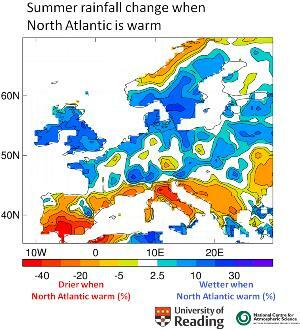 According to new research at the University of Reading published in Nature Geoscience, the North Atlantic warming in the 1990s coincided with a shift to wetter summers in the UK and northern Europe and hotter, drier summers around the Mediterranean. The patterns identified match those experienced this summer (2012), when the UK had the wettest summer in 100 years, while the Mediterranean suffered with temperatures as high as 40 degrees centigrade or more. The temperature of the North Atlantic swings slowly between warmer and cooler conditions, and the present warm phase has a similar pattern to warm conditions that persisted throughout the 1930s, 40s and 50s. During the 1960s, 70s and 80s cooler conditions occurred over the North Atlantic. Computer simulations suggest that these changes in ocean temperature affect the atmosphere above. Warmth in the North Atlantic causes a trough of low pressure over western Europe in summer and steers rain-bearing weather systems slap-bang into the UK. Professor Rowan Sutton, Director of Climate Research in the National Centre for Atmospheric Science and a researcher in the University of Reading's Walker Institute, led the research. He said: "The North Atlantic ocean has alternated slowly between warmer and cooler conditions over the last 100 years. We saw a rapid switch to a warmer North Atlantic in the 1990s and we think this is increasing the chances of wet summers over the UK and hot, dry summers around the Mediterranean - a situation that is likely to persist for as long as the North Atlantic remains in a warm phase. "A transition back to a cooler North Atlantic, favouring drier summers in the UK and northern Europe, is likely and could occur rapidly. Exactly when this will happen is difficult to predict, but we're working on it." The North Atlantic warming and cooling cycles are known as the Atlantic Multi-Decadal Oscillation (AMO) and they affect temperature, rainfall and wind patterns over Europe, Africa and North and South America. Previous research has suggested the warm and cold swings are related to changes in ocean circulation. Other research at Reading has suggested that it may be possible to predict the warming and cooling cycles some years ahead. During the 1990s the North Atlantic shifted to a warm state similar to that experienced during the 1930s, 40s and 50s, and this warm state has persisted to the present day. The swings in the temperature of the North Atlantic are additional to a long term (century timescale) warming trend that is mainly due to increasing concentrations of greenhouse gases in the atmosphere. It is likely that the swings in the temperature of the North Atlantic have also been affected by human activities - both greenhouse gas emissions and other forms of pollution. Understanding how important these factors have been is a subject of active research. Between 1930 and 1959, the summers with the highest annual rainfall were 1930, 1931, 1932, 1946, 1950, 1954 and 1958. More recently, the summers of 2000, 2007, 2008 and 2012 have also been characterised by above-average rainfall. (Source Dr Roger Brugge, Department of Meteorology, University of Reading). This assessment is based on the extended April-September summer season. Note that the evidence presented in this paper relates to seasonal rainfall averages rather than individual rainfall events. The map above shows the pattern of changes in summer rainfall that occurred in the 1990s when the North Atlantic Ocean warmed rapidly. The figure shows June-July-August rainfall changes expressed as a percentage of the long term average rainfall for the season. Blue indicates more rain since the 1990s and orange/red less rain. More images are available - contact the University of Reading press office, details as above. This research was carried out as part of the climate programme of the National Centre for Atmospheric Science (NCAS) by scientists within the University of Reading's Walker Institute. NCAS aims to increase knowledge of key environmental issues including: climate change, weather processes and atmospheric composition. It is a Natural Environment Research Council (NERC) research centre. The University of Reading's Walker Institute for Climate System Research aims to enhance understanding and improve prediction of the risks and opportunities from our changing climate. The Institute brings together the unrivalled breadth and depth of climate expertise that exists within the University of Reading.